The Democratic leaders of six House committees are demanding that Congress have the full report by special counsel Robert Mueller “no later” than April 2. The chairmen of the panels wrote in a letter to Attorney General William Barr Monday that his four-page summary of Mueller’s work is “not sufficient for Congress, a coequal branch of government” to perform oversight duties. According to Barr, Mueller did not find that Trump or his associates colluded with Russia to influence the 2016 elections. By Barr’s account, Mueller did not implicate or exonerate Trump of obstruction of justice, effectively punting that question. The House intelligence committee is postponing an open hearing with a Russian-born former business adviser to President Donald Trump as Democrats seek more information about special counsel Robert Mueller’s Russia investigation. Intelligence committee spokesman Patrick Boland said Monday that the panel is instead focusing this week on bringing in Justice Department officials to better understand Mueller’s report. A four-page letter from Attorney General William Barr announced Mueller’s main findings, including no evidence of collusion by Trump’s 2016 campaign with the Russian government. Senate Democratic Leader Chuck Schumer is trying to quickly pass a resolution urging the public release of special counsel Robert Mueller’s report, but he’s being blocked by Republicans. Shortly after the Senate opened, Majority Leader Mitch McConnell objected to Schumer’s request. He says the Justice Department needs more time to wrap up Mueller’s two-year probe. The special counsel’s office is handing off a court fight over a subpoena issued to an unidentified company that refused to turn over information demanded in Robert Mueller’s investigation. Peter Carr, a spokesman for Mueller’s office, said Monday that the matter was being handed off to federal prosecutors in the District of Columbia. Sen. Lindsey Graham says he told President Donald Trump that the late Sen. John McCain “deserves better” than the president’s harsh criticism. The South Carolina Republican said Monday that Trump blames McCain for the Russia investigation. The former Arizona senator had turned over to the FBI a salacious dossier he received about Trump’s activities in Russia. McCain died last year. 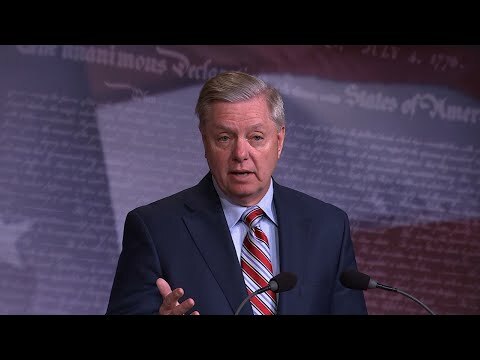 Graham said McCain did “exactly what he should have done” in giving the dossier to authorities. Kentucky’s Republican senators say special counsel Robert Muller’s investigation vindicated President Donald Trump, but a home-state, Democratic colleague in the House says many questions remain after the summary of Mueller’s report was made public. Senate Majority Leader Mitch McConnell said the special counsel’s conclusions confirmed Trump’s account that there was no effort by Trump’s campaign to conspire or coordinate with Russia to influence the 2016 presidential election.